In the mid ’80s he was involved in the occupation of the sacred mountain Mt Taiarahia (BOP) to stop Tasman Forestry planting pine trees in the area. At the time Iti was also involved in the, Maoist controlled “aid agency” CORSO, attending some meetings of the organisation’s national council. He was also CORSO’s fund committee representative. In February 1990 Iti 1990 appeared in a Whakatane Court, charged with throwing rocks at jetboats on the Whakatane river. Iti apparently objected to the “abuse and polluting of the river” by jetboating joyriders. He was involved in similar protests in 1988,89,1991 and 1992. In 1993 It travelled to the US to network with American Indian activists. 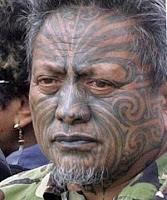 He also unsuccessfully stood for Parliament for Eva Rickard’s Mana Maori Party. In 1995 at a “Fiscal envelope” hui in Opotiki, Iti handed a blanket to then Minister of Justice, Doug Graham and asked for New Zealand back. The same year, Iti was involved in the Motua gardens occupation at Wanganui. In March 1996 Iti attended the 6th General Assembly of the People’s Plan for the 21st Century (PP21) in Katmandu, Nepal. Several New Zealanders, besides Iti have been linked to PP21. These include Aziz Choudry and Green MP Sue Bradford, who was in the early ’90s, a leader of the People’s Assembly which was affiliated to PP21. On Waitangi Day 1996, iti received the Kawariki Award, for efforts to have the Treaty of waitangi “honoured” at a special ceremony at Te Tii Marae, Waitangi. The event was attended by event attended by Syd Jackson and Hone Harawira’s Te Ahi Kaa and Te Kaho Maru and Toitutanga. In June 2000 Iti joined Piripi Haami and Anthony Tauni Ngatai-Sinclair in a delegation to Fiji to give support to George Speight’s “indigenous” and anti Indian coup. Last month (September 2007) he returned to Fiji to offer support to coup leader Voreqe Bainimarama.